As a wise man once told me, “it’s easy to wind something up. It’s quite another thing to unwind it”. Since 2013 the FHA and HUD have taken a number of steps to try to unwind the components of the Home Equity Conversion Mortgage that have led to increased claims against FHA’s insurance fund and those that negatively impact its projected future economic value of the program. Just how both agencies will continue to address this momentous challenge remains to be seen. While the increasing losses from HECMs are troubling, it should be noted that $73 billion of the $1.2 trillion of the insurance in-force in FHA’s MMI fund are HECMs. That is 6% of all loans insured by FHA are HECM loans according to a report last month from the Congressional Research Service. The problem is that even that small cohort of HECM loans can have a significant impact on the overall fund. While most may agree the most problematic issues in the HECM warranted correction, many are concerned that future policy changes are based on actuarial reviews. Reviews that have historically shown significant volatility and wild swings in their valuation of the program. The volatility of the NPVs of the fiscal year HECM endorsement cohorts lying in the MMIF is the imagination of those who spent the first eight years following the enactment of HERA trying to manipulate the positive results of the forward mortgages so as to be included at least in part into the economic value of the HECM. That is where all the volatility lies. One can easily describe this process as manipulation for the purpose of making the projected results in operations look far better than it actually was. When taken over by Dr. Carson, the reporting on the NPVs of the HECM cohorts in the MMIF changed radically and covers all years since HECMs joined the MMIF. These NPV cohorts clearly show losses, each and every fiscal year. The NPVs are presented on a “Stand Alone” basis, meaning that since fiscal 2016, HUD does not consider the capital reserves or the results of operations in the forward mortgages within the MMIF when reporting on the HECM NPVs by endorsed cohort and the overall economic value of the HECM portion of the MMIF (which is simply the addition of the net assets held as part of HECM portion of the MMIF. Lenders, NRMLA, and even HUD to a large degree are overly focused on actual results of operations rather than actuarial results of operations with includes the actual results of operations; it is the projection that overwhelms the NPVs. Most industry participants want to believe that the results from changing things on the front or back end of the HECM will somehow magically appear in the fiscal year actuarial review and annual report immediately following such change. Yet that can be included if the results can be reasonably estimated. It is the assumptions where change must be made to stop the loss situation we see. Lenders did not understand the fiscal year 2010 budgetary projection by OMB back in fiscal 2009 and are almost as clueless about the actuarial projections of losses in more current actuarial reviews and annual reports. So where is NRMLA? NRMLA has yet to explain to its membership what conclusions it reached in the year it spent analyzing the actuarial reviews and annual reports. When Mr. Peter Bell boasted of its work last year in this regard, nothing was presented on the conclusions it came to or what it is doing to get actuarial assumptions moved in a more favorable direction to the projected results of operations for HECM fiscal year endorsement cohorts. For example much of the HECM REO being mentioned in Shannon’s report comes from years before fiscal 2009 when HECMs were accounted for in the G&SRI Fund, not the MMIF. Confusing the results of the two and overemphasizing the problem in the HECM portion of MMIF only adds to the confusion that faces the HECM program NOW. We are in difficult days but the work that is needed to get things more productive lie fading in the dust of wasted time. The appraisals where I have had to have 2 have been so out of touch with each other that I couldn’t even make it up. There is no possible way to explain this to the borrower and especially the Realtor if one is involved. For example, I had one brand new custom home in an established neighborhood in an established subdivision. First appraiser says “620,000 but the home is way overbuilt for the neighborhood affecting the marketability.” Second appraiser says “642,000 and the home is right in line with the comps and the marketability will be fine” AND YES, they both saw the same house. HOW on earth can anyone say this follows a SET standard? And I can give many more of the same. BOTH on Forward and Reverse. So my reasoning says how on earth does this give HUD any inkling on how the house will perform 30 years from now? It does not. What we have created, between financial assessment, overburdening PLF’s and now this 2nd appraisal option is a frustrated client, a frustrated pool of borrowers and just more ill will to knock our product to the ground. 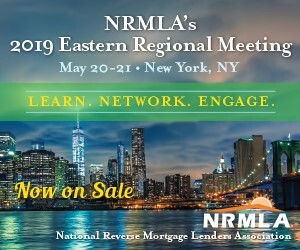 I too, would like to see more info from NRMLA as we have not had much true news on what is happening since the convention. Government shutdown or not, we are still trying to created a living for ourselves and a lifetime of happiness for our clients. SOMEONE out there needs to care more. I could not agree with you more when it comes to financial assessment. It does done more to bring on lower PLFs than any other singe HECM element. What a mess for a 3.5% difference in appraised value!!! The appraisal mandate has proven to be little more than misdirection in order to buy time before further reductions to the PLFs to accommodate the losses generated through financial assessment. The lenders demanded financial assessment without any realization of how its impact would bloat the negative NPVs for each new fiscal year cohort of endorsed HECMs following implementation of financial assessment. So we went from a fiscal year of dramatically reduced average per endorsed HECM negative NPV for fiscal 2014 of about $(15,500) to over twice that amount at over $(31,900) in average per endorsed HECM negative NPVs for both fiscal years 2017 and 2018. The average per endorsed HECM in fiscal 2013 (the fiscal year before the drop) was $28,557. So the current NPVs are worse than those occurring in fiscal years before fiscal 2014. Looking at Page 15 of the actuarial review for fiscal year 2018, FHA reported an average loss per HECM for the ten year period then ended of $(24,448). Before fiscal 2014 and the changes occurring on 9/30/2013, the average loss per HECM from fiscal 2009 to fiscal 2013 was $(24,748) with the greatest average loss per fiscal year in those five fiscal years occurring in fiscal 2009 where it was $(28,563) and the lowest during fiscal 2011 when it was $(19,431). The average per endorsed HECM negative NPV for fiscal 2014 was $(15.511). That is a reduction of 46% from that same average in fiscal 2013. In the four fiscal years since fiscal 2014, the average loss per HECM has been $(26,096) with a high (for all fiscal years since fiscal 2008) in fiscal 2017 of $(32,753) and a low in fiscal 2015 of $(17,915). In each year after fiscal 2014, the average negative NPV per HECM rose until fiscal 2018, the fiscal year that the PLF reductions taking place on 10/1/2017 went into effect. Yet the lower PLFs for fiscal 2018 has reduced the NPV from fiscal 2017 by just 2.4%. To get the negative NPVs down to zero will require even more drastic cuts in the PLFs. Will this help the HECM industry? Absolutely NOT. The only hope for PLFs is geocentric PLFs which for now seem to be dead on arrival. There seems little way to undo the very negative impacts of financial assessment; HECM lenders demanded it and now OWN it.